Maro’s beach, known as La Cala de Maro has just been nominated as the second best beach in the whole of Spain. The Spanish television station - Antena 3 - ran a poll that started in June of last year. La Cala de Maro received 57.299 votes falling a mere 3000 votes short of La Granadella beach, in Javea which has won for the second year in a row. Without a doubt, La Cala de Maro is a fantastic beach and well worth visiting. Unlike many of the other beaches in the Acantilados de Maro-Cerro Gordo natural area, it offers parking and a restaurant. Its fame and easeofaccessdoes also mean that it can get crowded in the summer months. 'Crowded' being a very relative term. As crowded as any of these Acantilados de Maro beaches can get. Which is far less so, than the more popular city beaches. Parking in particular though, can be problematic. The set parking area fills up quickly and people park wherever they can/want. Leading to all kinds of access problems. A far quieter and lesser known option is a neighbouring cove, known as Playa de la Caleta or just as La Caleta de Maro (Maro's little cove). La Cala de Maro’s little brother. It is equally as beautiful and usually far less crowded. Access is slightly more problematic than Maro's main beach, but this adds to its seclusion and ensures its never too busy. From Maro’s centre you take the road down to the coast, following signs for the playas - beaches. The same road you would take down to La Cala de Maro. Playa de la Caleta beach is situated here. The road winds around to the left and downwards. Keep your eyes open for a small slip road on the right that runs between two greenhouses. There is a sign for the La Caleta de Maro beach, but its conveniently placed just after the turning. An easier point of reference is a sign to a yoga studio, ‘Massage / Yoga Maro.’ The spray painted white sign is clearly visible and right on the track you want to turn onto - shown in the picture. I suggest parking here or anywhere you can nearby. Some people drive down, but the road is not great and can be a nightmare getting back up the hill, particularly if stuck behind farming machinery/goats etc - this is farming country. The area around Maro is known for its organic farms. Walk down the road, passing several greenhouses and fields. Take the first right onto another smaller track. Its easy to miss and doesn't look like it leads anywhere. At the time of writing, there was a sign, but it didn't look very permanent. Being made of paper and sellotaped to a pole. If lost, ask for directions, there’s usually someone working around the greenhouses or making their own way to the beach. If you do miss the turning, you’ll quickly know, the other road leads to a cliff. Just double back and look for the right track. Follow this track for another 200-300 metres, don't take the first left, keep following the track, it eventually winds leftwards at the bottom. There’s no way to get lost here, the sea is clearly visible. There’s a small parking area and a number of steps leading down to the beach. There are several rivers in this area and run off from the farms has produced an almost ‘tropical’ environment, with bamboo and sugar cane running along the beach. La Caleta de Maro offers no facilities. You need to bring water, food and everything you need with you. As with all beaches in this area, the snorkelling is fantastic. Particularly if you going eastwards. You swim past a rocky outcrop and there’s a small freshwater waterfall which drops straight into the sea. An idyllic spot, with a small sandy beach. 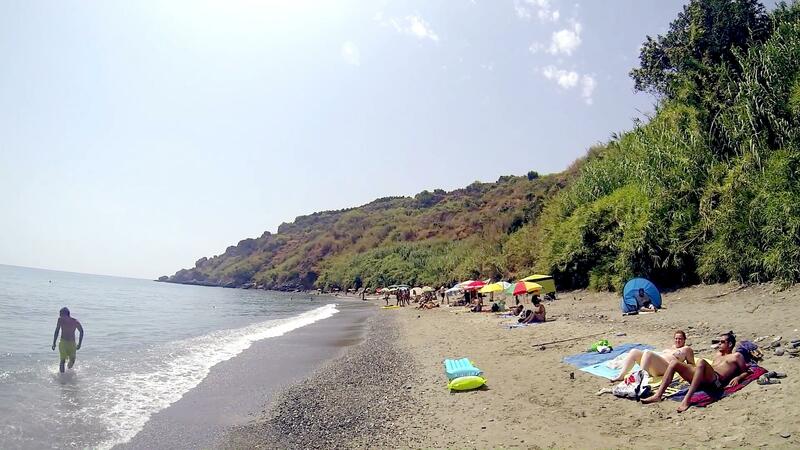 For the more energetic you can swim to the larger La Cala de Maro beach quite easily. The way back up is hard going, particularly on a hot summer’s day. Near the top, we found a great freshwater - stream fed pool to cool off in and wash all the salt off. Its a man-made water deposit (no longer used) that is clearly visible just alongside the track, about 100m before the main road - here. The water is clean and extremely cold. It makes a great way to end a day at the beach. For additional information on beaches in the area - see our definitive guide to Nerja's beaches or the nudist beach Playa de Cantarrijan, Playa del Cañuelo, considered by many to be the best beach in the area, neighbouring beach Las Calas del Pino and, of course Playa de las Alberquillas.